The single most important question for an investor to ask him or herself is, “Why am I investing?” The answer to that question will influence everything about the way you manage your portfolio. Your goals will influence everything about the way you manage your portfolio: from your time horizon, to your savings rate, and critically, your asset allocation strategy. (For more information about these asset classes, DIY.Fund founders, Eric and Wendy Nissan explained them in detail on this episode of the Martinis and Your Money Podcast). Why does asset allocation matter? Asset allocation is the language of your portfolio; it tells you whether you are seeking aggressive growth , if you are seeking to preserve captial, or if you are seeking some mixture of the two. Asset allocation is how an investor’s willingness to take on risk manifests itself within a portfolio. Someone who is willing to take on a higher level of risk to achieve higher returns will seek an “aggressive” portfolio allocation. 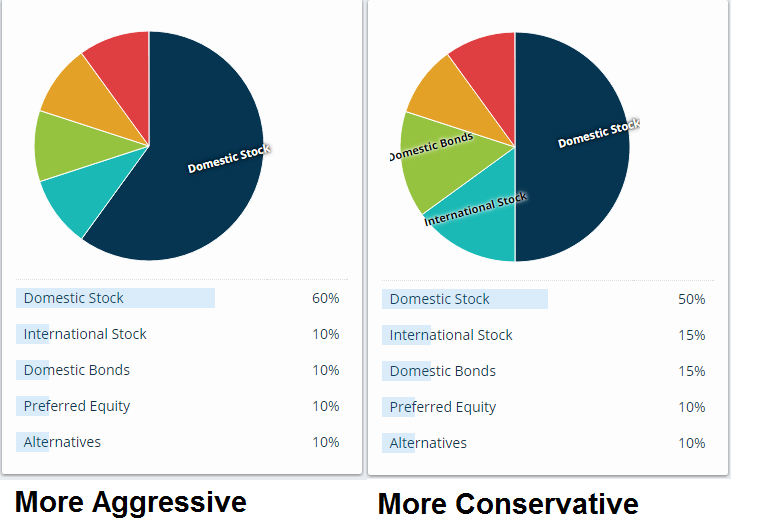 On the other hand, an investor who has a lower risk tolerance and wants to maintain the value of their portfolio more than they want to grow their portfolio will seek a “conservative” portfolio allocation. A more aggressive asset allocation has a greater percentage of the portfolio dedicated to stocks than fixed income. Unfortunately, many investors ignore asset allocation and pick and choose investments based on the current economic landscape or their emotions instead of based off of their goals. This method of choosing investments is unlikely to yield the performance that the investor desires. Investors who use their goals to determine their asset allocation (and who rebalance regularly) increase the likelihood that their money will be available when they need it. How should I choose my asset allocation strategy? An appropriate asset allocation strategy starts with your goals and your timeline. In general, investment goals with shorter timelines (such as buying a house in 3-5 years) lead investors towards conservative asset allocations (focused more on not losing money). This is because investors need access to their money sooner rather than later. On the other hand, investors with a longer timeline (such as a young person investing for retirement) tend to have more aggressive allocations (focused more on growth or income potential). Once you’ve determined your goals, you can create and manage individualized portfolios for each goal. You can use the allocation and goals wizard on the DIY.Fund homepage to help determine your strategy. This tool (along with the rest of the DIY.Fund tools suite) will allow you to set and manage asset allocation goals that consider your personal risk appetite, the timeline for your goal, and your willingness to manage your fund. By thoughtfully considering their asset allocation strategy, DIY investors will find it easier to strategically invest, to deal with market volatility, and to think of their portfolio wholistically. These actions will tend to yield better risk adjusted returns in the long run, and it increases the likelihood that investors will have the money that they need, when they need it.